I helped out my super talented friend Velicia from Delectable Whimsy the other day with a product shoot and I just had to share some of her stuff! It is so cute!! I love miniatures, and these are so real looking that you just can’t help but want to take a bite. Velicia got her start with polymer clay from a class she took in high school. She thought it was fun, and loved the detail that could be created with the clay. She didn’t really think about making it a business though until later when she was trying to think of a special, unique gift for her daughter’s friend. 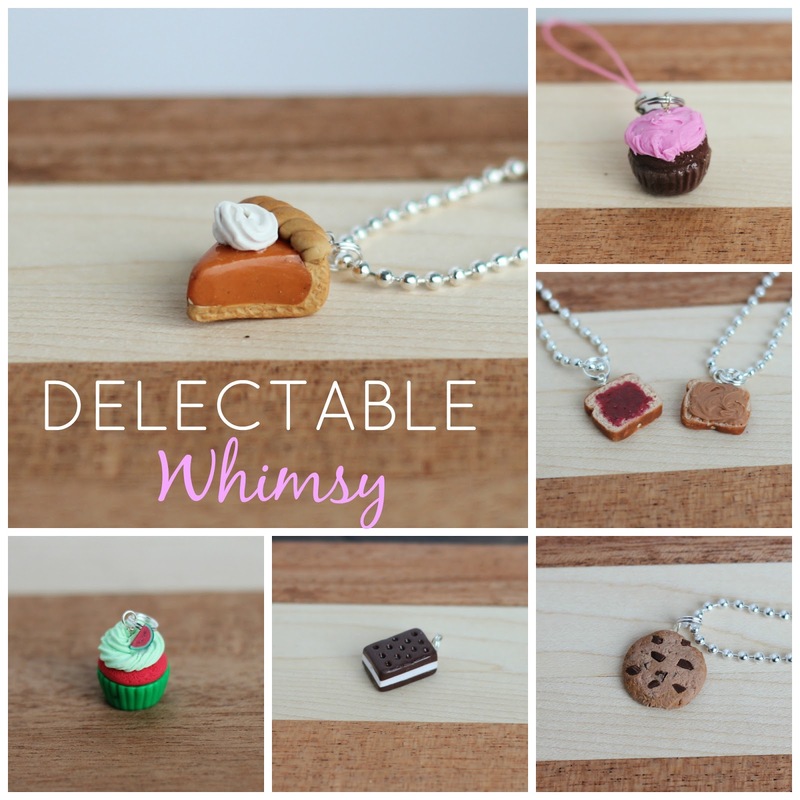 One thing led to another and Delectable Whimsy was created! Velicia has a lot of different types of cupcakes for sale on her etsy shop so if you have a cupcake cutie out there, check it out! You can also follow her on instagram for her most recent creations and ideas. She is so dang creative! Okay, this is making me hungry!! I love sweets! Oh my goodness, those charms are absolutely adorable and so realistic looking too! Thanks for the party girls! Have a great week. So cute and I love the, "You are the peanut butter to my jelly" pair, that's what my daughter calls them. These are super cute! They make great gifts! Thank you for sharing these adorable charms with us at the Healthy Happy Green and Natural Party! Pinning and sharing this! Super cute cheeseburger charm features realistic-looking buns, cheese and a beef patty. Tiny and delectable yet not short of adorable, this cheeseburger charm is a real treat for all cheeseburger lovers and anyone that doesn’t like veggies in their burger! I sculpted the cheeseburger by hand from polymer clay, mixing just the right colouration to colour the buns and textured it for a realistic look. The teeny tiny details and the realism will make you smile!